Mike Ullery | Daily Call Retired Hartzell Propeller employee Craig Barhorst explains the operation of a variable-pitch propeller to students from Miami East High School during a tour of the Piqua facility on Wednesday. Retired Hartzell Propeller employee Craig Barhorst explains the operation of a variable-pitch propeller to students from Miami East High School during a tour of the Piqua facility on Wednesday. 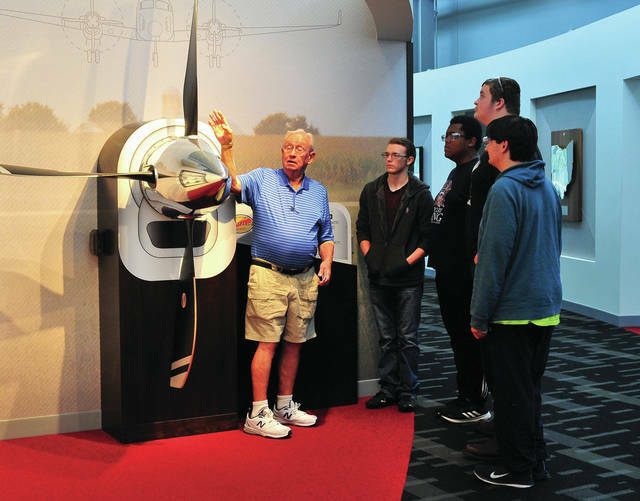 https://www.dailycall.com/wp-content/uploads/sites/30/2018/10/web1_100318mju_hartzell_tour.jpgMike Ullery | Daily Call Retired Hartzell Propeller employee Craig Barhorst explains the operation of a variable-pitch propeller to students from Miami East High School during a tour of the Piqua facility on Wednesday.